There are things that happen in life that will forever shape your psyche. For me the recent internet shutdown is one of them. It seems it also altered the way Zimbabwean people view the internet and their knowledge of it. VPNs were something people rarely used- the stuff of geeks. 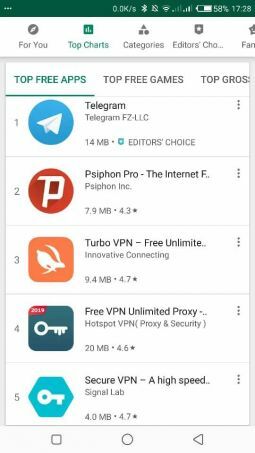 Two screenshots taken of the top Zimbabwean apps in the Google Play Store before and after the shutdown show how popular VPNs became during this time. 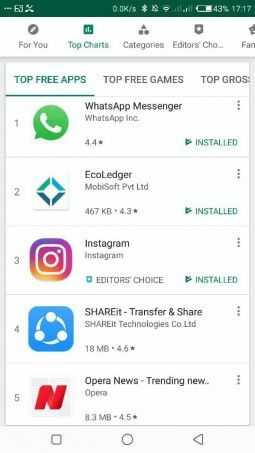 The most popular apps before the internet shutdown are exactly what you would expect with WhatsApp leading downloads. That is quite understandable as WhatsApp is considered the internet by most people. Ecoledger is a useful app that creates beautiful Ecocash statements and given the popularity of Ecocash it is also easy to see why it’s also up there. So the government decided to illegally shutdown the internet twice, yes I am going to keep saying illegally, and blocked certain social media apps and sites people scrambled to find ways to bypass this blockage. Telegram hitherto something we barely used suddenly became the leading chat app and WhatsApp replacement. Several free VPN apps, most of which harvest your data and sell it to the highest bidder, suddenly saw an explosion in downloads. Even the government has confessed to being part of the hoards that used VPN in order to bypass their own ill-advised blockages. Talk about hypocrisy.